One of my longstanding peeves with Mac OS X is the lack of a pull-down calendar in the menubars default Date & Time settings. If you click on the time, instead of seeing something useful like a calendar or more date/time details, you just have options to set an analog clock or open Preferences. I’ll stop complaining, because now a little app called Day-O solves that problem. 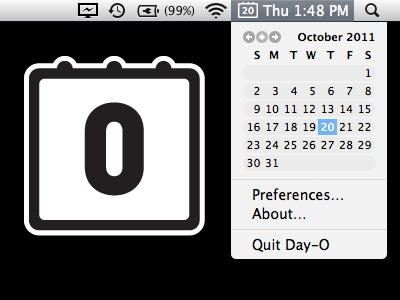 Day-O offers an attractive and functional replacement to OS X’s Date & Time, plus it’s free to download. Now you won’t need to open up iCal every time you just want to see what day of the week a certain falls on. And yes, you can disable the little miniature date icon too. Update: The app is still free to download but the developer stopped the direct download link. Go to the website and you can still get it for free. Sorry for the inconvenience, we reached out to the dev and are waiting to hear back. If you open date and time preferences you end up with a Calendar that is visible, but that is one additional click. I see you are impatient. I don’t think that he’s (or most of us for that matter) are impatient because we want an accessible calendar right off our desktop. A user shouldn’t have to navigate to any “System Preferences” or similar spot to check a date and is a great enhancement to the OS X UI. I simply use Dashboard as my quick calendar. :) One mouse/keyboard press. wallpaper of the first image? In Lion, Dashboard doesn’t keep the desktop visible. Is there a way to change that? If so, I’d use the calendar widget for this purpose. Like the developer, I previously used MenuCalendarClock. So I’ll give Day-O a shot. Thanks. meli, you can disable the Dashboard “show as a space” feature in Lion which makes it hover over everything, it’s in the System Preferences for Mission Control. If you start the date and time format with H you can get a 24 hour clock. But….how can I get the day of week to show? The ‘EE’ format (or ‘EEE’) is that what are you looking for. Hey, but I see you are running iStats, it does that already and more. I even bought it. Yes it’s that good in my opinion. I’ve never cared about a pull-down calendar. I don’t see an added value of an additional pull-down calendar if there’s already a calendar in Dashboard. The calendar in Dashboard is even quicker to access than a pull-down calendar, as Dashboard can be accessed with a simple gesture. What I don’t understand is why Apple doesn’t include the number of the week in their calendars. I use Calendar (http://qbix.com/calendar) and it gets the job done. The download link doesn’t work! It’s not free anymore?? Day-O is still free, but you need to click the link from the developers site now to download it. Why no App Store link? Does it work with snow leopard? i have tried this, Calendar Qbits and Fantastical. Fantatsical is by far the best! Just allow its entry in keychain, if needed. Same here. I got fed up with the necessity to open the Calendar and wait for a few seconds just in order to see the days of the month. 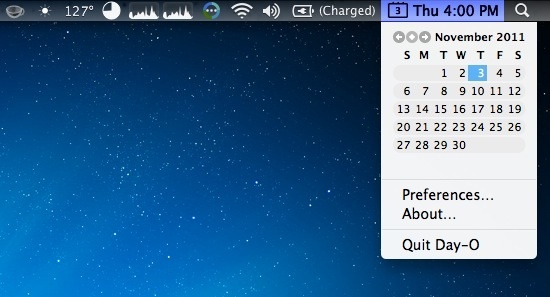 MagiCal is simple and versatile menubar calendar free app.